With a record of ticket admissions on its first premier day in South Korea on the last week of July 2017, it was certainly an easy decision for my wife and I to see this movie when it officially premiered in Indonesia today. As it happened, we were having plans to have another one of our staycation, but due to some reasons, it was cancelled. Since I already applied for 2 days leave earlier and having lots of free time, we could see this one in the afternoon which was nice as the cinema was not too full. So what made this movie so appealing to audiences? Let us get on with the movie now. Movie was set in the year 1945 during the era of Japanese occupation in Korea. The Japanese military was having a location on Hashima island where the Koreans were forced (or conned) into working as labors to mine coals. The situation was very bad for the workers as even though they were being paid some small salary, there was never enough balance due to various deductions. The work conditions were also very bad for them as the mines were dangerous with leaking gas and lack of healthy food, while the women were forced to become "working ladies" to serve the Japanese. A jazz music group led by Gang-Ok (Hwang Jung-min - The Himalayas etc) with his daughter So-hee (Kim Su-an - the young girl in Train to Busan) were part of the few hundred Koreans who were told they could get a lot of money by working in the island. In the ship that was carrying these workers, there was a gangster leader named Chil-sung (So Ji-sub - Cain and Abel, Master's Sun TV series etc) who was very good in street fights. There was also a foul mouthed woman named Mal-nyeon (Lee Jung-hyun - Alice in Earnestland, The Admiral: Roaring Currents TV series etc) who was not afraid of Chil-sung. On this island, there was a so called "leader" of the Koreans whom these people looked up to. His name was Yoon Hak-cheol (Lee Geung-young - Minority Opinion, Inside Men etc). Because of his strategic position, the Korean military has assigned Park Mo-young (Song Joong-ki - A Werewolf Boy, Descendants of the Sun TV series etc) to infiltrate the island with the sole task of bringing Yoon out of the island. So how would everyone survive the dire situation in the island? Could Mo-young succeed in completing his mission? Find them all in this emotion draining war drama action movie. Waaaa, this was a classic Korean type of movie with cool action and lots of emotional moments. 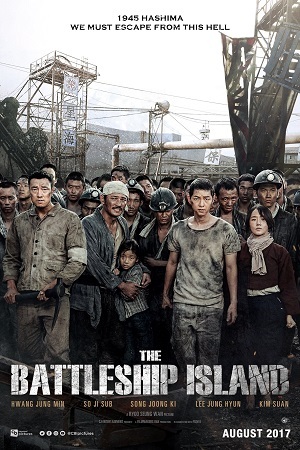 It was a fantastic effort of the director Ryoo Seung-wan (who had directed some commercially successful movies such as The Unjust and Veteran) to recreate the terror of a war era. My wife and I were amazed of how realistic the poor condition on the island and also the treatments received by the Koreans from the Japanese. I could also understand that this movie might be seen too much by the Japanese as it showed very harsh and violent conducts by their military. According to the various information available on the internet and also mentioned in the movie's opening scene, the movie was supposedly based on true facts. Apart from the possible propaganda by the Koreans for rising the patriotic feeling, the movie itself was amazing in terms of the action sequence. The acting of some of the characters were also amazing. I love the characterization of Gang-Ok by Hwang Jung-min and also his relationship with his daughter So-hee. The obvious attraction between So Ji-sub and Lee Jung-hyun was also interesting to see. While Song Joong-ki who played the cool headed military person was the apparent attraction for the younger female audience (as can be heard from their admiring voices, including my wife's, when he first appeared on screen). The main plot was pretty simple with some smaller side stories and few surprises as well. But the build up of the story from the introduction of the lead characters, to their survival story and ultimately the high octane super emotional climax was very good. I was amazed that the movie did not felt like a 2 hour plus movie which I consider a wonderful way of keeping the perfect pace that did not make the audience feel bored. The fighting and war scenes were quite gruesome and violent. The sound effects were amazing (I was satisfied with the cinema which I think had done something to make its theater's sound system better than my last experience there). The music was good, especially during the time the band was playing some songs. In the end, just like any other Korean movies, even for a war drama action type, it still managed to give lots of emotional moments (my wife still had her tears after the movie finished). I think that this was a wonderful movie with a complete set of experience you could have. But please do not expect this to be just a full blown action movie type since the message that the director wanted to convey was likely how bad the war affected everybody rather than just the action scenes. So if you are looking for a movie that created that sort of emotions (and if you are some of those fans of Song Joong-ki) then I gather you would not be disappointed seeing this movie. But if you are not a fan of this genre, then perhaps you would not be able to enjoy it. For me and my wife though, we were very satisfied seeing this movie.